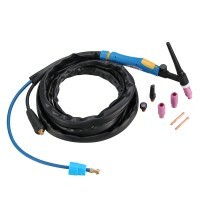 AMICO Professional Air Plasma Cutter Cutting Torch Gun Rated current: 5 Amp to 60 Amp Max severance thickness is 1.0 inch Torch Length: 13 Feet Use for AMICO CUT-50 APC-50 CTS-200 Air Plasma Cutting Machine ..
AMICO Power designed professional consumables set for models CUT-50 APC-50 and CTS-200. 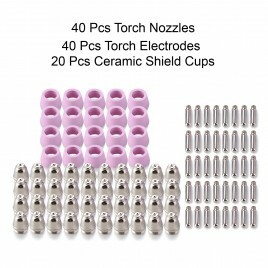 High quality 50-60 Amp (SG-55/AG-60) air plasma cutter torch consumables. Package Includes: 20 pieces torch nozzles. 20 pieces. torch electrodes. 10 pieces ceramic shield cups. Total 50 piece of consumables. Nozzles and electrodes are made by 100% copper. ..
AMICO Power designed professional consumables set for models CUT-50 APC-50 and CTS-200. 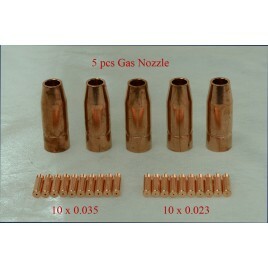 High quality 50-60 Amp (SG-55/AG-60) air plasma cutter torch consumables. 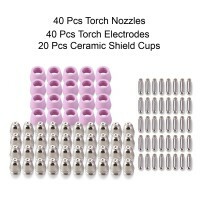 Package Includes: 40 pieces torch nozzles. 40 pieces. torch electrodes. 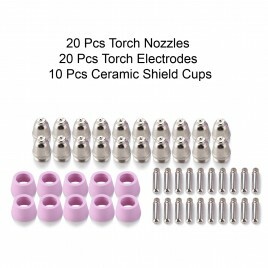 20 pieces ceramic shield cups. Total 100 piece of consumables. Nozzles and electrodes are made by 100% copper. ..
Use For All Model: TIG-160DC/TIG-180DC/TIG-200DC/TIG-220DC, TIG-165/TIG-185/TIG-205/TIG-225 & CTS-160/CTS-180/CTS-200 WP-26V TIG Welding Torch Gun Is with Gas Control Function, You Can Control the Gas Easier. 200 Amp 13 Feet Gas Power Hose Connector and 2 Pins Female Socket. Apply to All TIG Welding Machine of Amico Power. 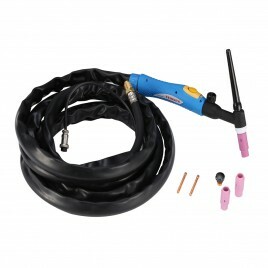 ..
Use For All Model: ST-165 / ST-185 / ST-205 / MTS-165 / MTS-185 / MTS-205 WP-26V Lift-TIG Welding Torch Gun Is with Gas Control Function, You Can Control the Gas Easier. 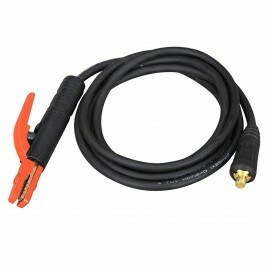 200 Amp 13-Feet Power Torch Assembly and Extra 6.5-Feet Gas Hose. Apply to All Lift-TIG Welding Machine of Amico Power. 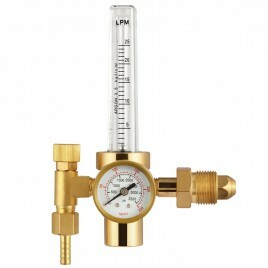 ..
Argon Co2 Gas Regulator TIG MIG Welder Gauge Multifunction Connector, Use for all TIG model: TIG-160DC, TIG-180DC, TIG-200DC, TIG-220DC, TIG-165, TIG-185, TIG-205, TIG-225 Use for all MIG model: MTS-165, MTS-185, MTS-205 .. The stick electrode holder and cable assembly kit includes a 500 amp stick electrode holder and Twist-mate adapter set. 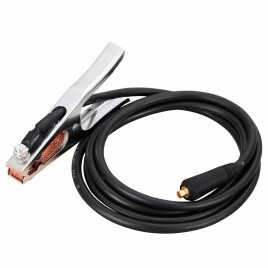 It installs easily to your equipment and is ideal for a range of stick welding tasks. 35-50mm Lead Dines Starter kit with a 500 Amp stick electrode holder Versatile design for a range of stick-welding applications Installs easily and reliable operation .. 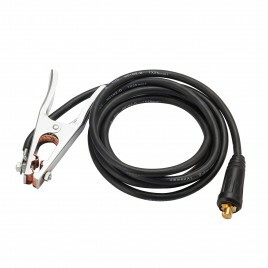 The Earth Ground Clamp and cable assembly kit includes a 300 amp Earth Ground Clamp and Twist-mate adapter set. It installs easily to your equipment and is ideal for a range of stick welding tasks. 35-50mm Lead Dines Starter kit with a 300 Amp Earth Ground Clamp Versatile design for a range of stick-welding applications Installs easily and reliable operation ..
300 Amp Stick Electrode Holder and 10 ft. Cable Assembly Kit The stick electrode holder and cable assembly kit includes a 300 amp stick electrode holder and Twist-mate adapter set. It installs easily to your equipment and is ideal for a range of stick welding tasks. 10-25mm Lead Dines Starter kit with a 300 Amp stick electrode holder Versatile design for a range of stick-welding applications Installs easily and reliable operation .. The Earth Ground Clamp and cable assembly kit includes a 300 amp Earth Ground Clamp and Twist-mate adapter set. It installs easily to your equipment and is ideal for a range of stick welding tasks. 10-25mm Lead Dines Starter kit with a 300 Amp Earth Ground Clamp Versatile design for a range of stick-welding applications Installs easily and reliable operation ..
MTS-205, MTS-185, MTS-165 MIG Welding Gas Nozzles & Tips 5 Premium quality Lincoln style MIG Gas Nozzle 10 Pieces 0.023 Contact Tips 10 Pieces 0.035 Contact Tips The ideal replacement part Tough copper construction This Nozzle & Tips is designed for use with gas welding with MIG and wire feed welders. 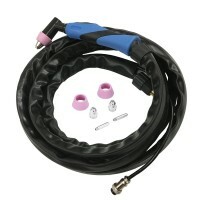 The replacement part is compatible with a variety of AMICO POWER's MTS-205, MTS-185, MTS-165 MIG Welding guns. ..